This video gives the phrase "up with the birds" a whole new meaning. 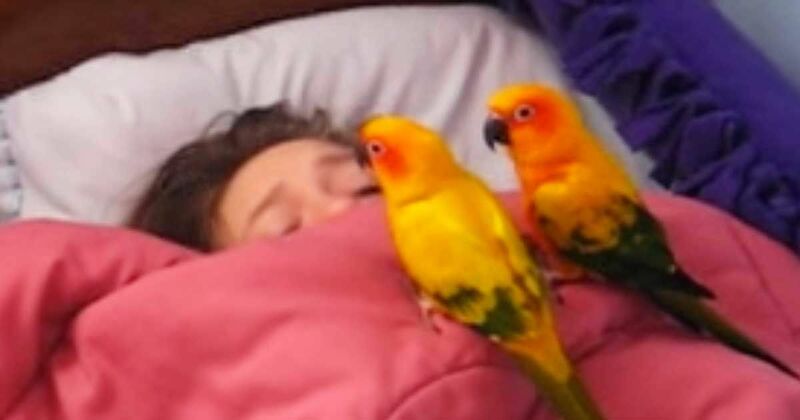 In the viral YouTube video, that's been viewed more than 5 million times, a pair of persistent parrots wakes up their human sister in an adorable way that's captured the hearts of millions. At first, the pair is at the foot of the bed just looking at their sleeping sister. But soon the woman behind the camera tells them to "go ahead" and wake her up - so the two waddle over to her and stare down at her while sitting on her chest. When the girl wakes up, two pretty little birds are staring at her endearingly! Then, they hop right under the covers with her, occasionally poking their heads out at the woman behind the camera - who is getting a kick out of it all. Those birds might have gone in there with the intention of waking their sister up, but it really looks like they were just in it for the snuggles. This video is too cute - so don't miss it! Check out the video everyone is talking about right here below. Nothing like morning snuggles, right? Don't forget to share this cute video with your friends on Facebook, Twitter and Pinterest.